A 'peep' at the south end of the Lake, NyneeTal. bl.uk > Online Gallery Home	> Online exhibitions	> Asia, Pacific and Africa Collections	> A 'peep' at the south end of the Lake, NyneeTal. 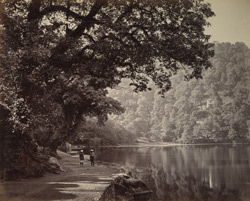 Photograph of the lake in Naini Tal, taken by Samuel Bourne in the 1860s. According to legend, Nainital takes its name from the Hindi word for eye as it is said to be the spot at which Sati's (Parvati) eye fell to earth and is one of the 64 Peethas, or sacred pilgrimage sites in India, dedicated to that goddess, who is worshipped at the Naina Devi Temple, situated at the northern end of the lake. The lake forms the focal point of Nainital and is surrounded by high peaks covered in woodlands. The area of the Kumaon Hills had come under British rule after the Anglo-Nepal War (1814-16) but it wasn't until 1841 that P. Barron built the first European house in Nainital. The town became the summer headquarters of the colonial administration of the province. It was a popular retreat for the residents of the plains. Being popular with the British, the town developed a British character with several European schools, barracks and a sanatorium.